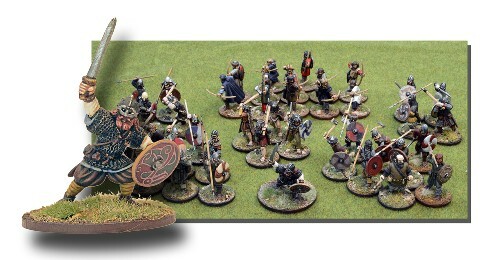 These are 6 point, full Warbands (instead of the 4 point Starter Warbands) and will give you a rounded Warband at a substantially discounted price without the need to worry about additional reinforcement packs. Each Warband will have a different Warlord figure to the one in the 4 point version of that faction. Plus, each box will contain a set of 4Ground Fatigue markers (the Jomsvikings will get Wrath/Fatigue markers,) along with all weapons, shields and bases. Contains Warlord, one unit of 4 Berserkers, two units of 4 Hirdmen (Hearthguards), two units of 8 Bondi (Warriors) and a unit of 12 levy Archers plus all appropriate weapons, shields and bases. PLUS MDF Fatigue Marker set.